What’s New in Attendee Acquisition? 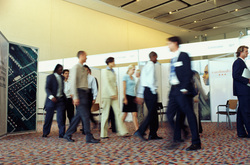 I recently asked the following question on LinkedIn: Hi exhibition industry friends. Out of curiosity, what other attendee promotion/recruitment tools are you doing besides print, death by email and digital-based outreach? The reason I asked the question was two-fold: It seems many show organizers are over-dependent on emails to get the job done for recruiting quality visitors; and wanted to know what else industry colleagues are doing. Snail Mail, otherwise known as using The Post. Printed materials sent to an attendee prospect means they will be physically touched and looked at, or even read – not simply deleted without opening. Depending on how efficient your country’s post is, it may be worth to look at incorporating interesting printed materials back into your marketing mix. One of the best printed pieces I saw recently was fairly small, but offered the top 10 solutions for a huge industry problem. They offered the #1 solution on the piece, and then directed the reader to the other nine solutions available on the website. Offer real content. There is a lot of knowledge produced at every exhibition. Share it! Be very careful not to “Bait and Switch” (lure someone in with promised content, then deliver an ad for your show or a sponsor) as you will forever lose trust with your audience. If you are offering a white paper, make sure it is the best content possible. Phone calls. Talk to attendees. See what their needs are. New technology? Ways to streamline their manufacturing processes? Help navigating the new world of retail? Not only will the knowledge help determine educational offerings; it can help you sell exhibitors! This includes retargeting, influencer marketing, social media, exhibitor invitations and/or referrals, data mining and more. Of course, it will be interesting to see what will happen after GDPR goes into effect.